Debra Gabel here! I had to comment on your posting about my stamps and your suggestion to do international cities...LAST NIGHT I did Paris! lol. Today I went to my email and then to your blog and saw your suggestion! Isn't that ironic! Yes - I already have plans for my next book submission to C&T... Blocks around the world! If you want a sneak peek - go yo my blog at www.zebrapatterns.com! Too funny! 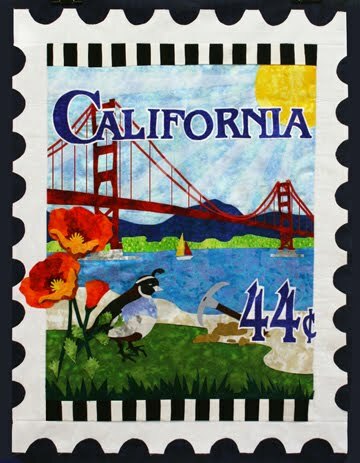 Debra, your stamp quilts reminded us so much of travel posters, so we immediately thought of stamp quilts for cities and countries around the world. We were so proud of ourselves for "coming up with the idea" - or so we thought - and then saw that you had already done it, AND, that you have a second book in the works... while the first one is going to press! Great minds think alike?! (LOL) Sincere congratulations on your book(s)! Nice quilts. 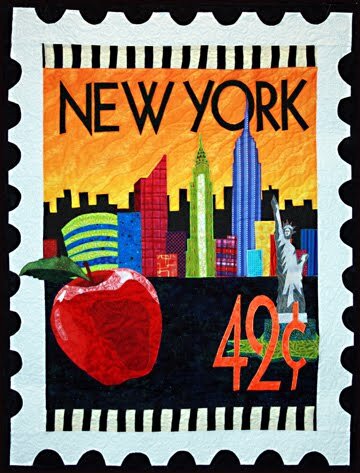 As a lover of postage stamps (never got into really collect them...I just love their designs) I've long thought stamp quilts would be great fun. Congrats, Zebra, on the book! 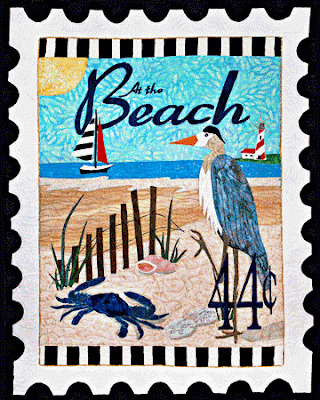 Fabulous stamp quilts! Can't wait to see what you have for Kentucky! I am working on the Texas and Maryland quilts. Can you tell me if you stitched down the organza? If so, did you just do a straight stitch or a tight zigzag?